Silver gives Idiot Hair a whole new meaning. Image by luo-qin . Used with permission. Either it's unconscious telekinesis or itsy-bitsy teeny-weeny muscles (or just the animators being weird! ), but however it's managed, the character's hair is independently mobile and responsive to their moods. Sometimes it's nothing more than a pigtail that sticks out straight in defiance of gravity when the character's shocked or frightened, but it can go so far as fully prehensile braids that shape themselves into hearts, question marks, and other iconic forms. See also its sister trope, Expressive Mask, and its (occasionally) more violent cousin, Prehensile Hair. See also Expressive Ears, Expressive Accessory. Can be related to Kaleidoscope Hair if the hair changes color. In Naruto, it happened with Kushina's (Naruto's mother) hair. Whenever she handed out violent retribution for people making fun of her (her round face and red hair), earning the nickname "Red Hot-Blooded Habanero", her hair floated wildly in the air. Furthermore, the Naruto cover for chapter 503  ◊ features Kushina's hair resembling Kyuubi's tails, symbolizing her status as the previous Kyuubi Jinchuuriki. Alucard from Hellsing chose his form as the vampire we see, so when he gets bit on the crazy bloodlust side, his hair writhes like tentacles and get more of a jagged outline. Ranma has the "simple" extending pigtail form. A Filler manga story has Genma Saotome take a hair-restoring tonic that gives him a ridiculously large, spiky hairdo (a parody of the hairstyles of Super Saiyans from Dragon Ball Z) when he's angry, which actually attacks the source of his anger. Ma Renka in Kenichi: The Mightiest Disciple has two short pigtails that droop when she's sad, stand up when she mad, and wag when she's happy! Shiho ◊ in Mai-HiME has four long curls/ponytails which take on a life of their own whenever she gets angry, going so far as to manifest little snake heads at their ends or spontaneously throttle people when she's particularly upset. Shiho's counterpart in Mai-Otome wears the same hairstyle but it seems somewhat less versatile ◊ (although still expressive). Arika's waist-length braids have been everything from an ant's antennae to punctuation marks to a heart ◊, in addition to generally flailing about whenever she gets excited. In Negima! ?, an Alternate Continuity of Mahou Sensei Negima!, Asuna's long ponytails are almost as expressive as Arika's braids; in the first episode alone, they stand up when she is agitated, and repeatedly formed the numerals for the number of minutes of extra sleep she wanted. And as if that weren't enough, the bells she wears in them get into the act as well, firing off like cannons when reaches a certain level of frustration. Here, being expressive is the default state of Asuna's hair, forming anything from exclamation marks and question marks to words and Cross-Popping Veins. Natsume Kanno's hair occasionally sprouts flowers. Chanohata Tamami's braids are known to rise up in anger. Momono Megumi's hair antenna can be used to point or form punctuation. Hana-chan in Fruits Basket, whose hair was apparently attuned to electrical signals. Elizabeth in Maburaho on many occasions, as well as one expressive hair battle between Yuuna and Kuriko. Sailor Moon uses this effect to make Usagi (whose name means "bunny") vaguely resemble a rabbit at comic moments. Not to mention that during transformation sequences, her odango seem to move on their own in whatever way they want, regardless of the external forces. There's even an early example of her round balls turning into detached stars for a moment. Parodied in Azumanga Daioh, Osaka has odd fantasies about the way Chiyo's pigtails work, e.g. when she lifts one, the other goes up too, they enable flight, they talk, and they pop off and can be replaced with new ones. Also played straight on occasion. Edward Elric's braid (and the rest of his body, for that matter) flares up when ever someone calls him short on Fullmetal Alchemist. Mr. 3 of Baroque Works often forms his number-three-shaped top-knot into question marks and exclamation points. For some reason, when he is about to use his Doru Doru powers, the tip sets itself on fire without the flame spreading or him feeling it. The flame is here because, y'know, he's a self-proclaimed candle-man. And then there is Franky whose hair works as a fuel gauge and also indicates what kind of fuel he's currently on. Franky can now control his hair by pressing down his nose. Considering how much Oda loves afros and mohawks, it's no surprise that this is currently all it's been used for. Tenma from School Rumble has stubby not-quite-antennae sprouting from her temples which waggle when she's happy or angry. This is lampshaded in the manga once: she's feeling decidedly mixed, so one not-quite-antenna is sticking straight out, the other straight up. This happens in every single Hayao Miyazaki film — when she's angry or surprised, the female lead's hair will visibly puff up. And in one movie, the male lead. He even managed to do it once with his hat. The titular character in Howl's Moving Castle is prone to this, though it might help that he is a Bishounen wizard. this has become so common in Ghibli animation that the "Ghibli Pouf" is something of a legend. Bakura and Malik in Yu-Gi-Oh!, as well as Takuma Saiou in Yu-Gi-Oh! GX, get much more bizarre hairstyles when their evil sides emerge. The same thing happens with Yugi, although in his case the only change that occurs when Yami Yugi appears is that lightning-bolt-shaped strands of hair float up. In the unexpectedly violent anime/manga Alien Nine, the winged hat-like alien symbiotes eventually transform themselves into consciously controllable, spike/spear/drill-forming hair, replacing a host's natural hair. Ranka in Macross Frontier has startlingly mobile hair, a legacy of her quarter-Zentradi genetics. In Macross Delta, the strands of hair that hold Freyja's Rune are quite mobile, due to her being Windermeran. Sasami in the Pretty Sammy series has two long tails that often contort and stand on end when she's stressed. Princess Tutu rarely does this, but there is one comical scene when Fakir is surprised and the bangs covering his face stand straight up in shock. (Oddly enough, his ponytail doesn't do this.) Ahiru's Idiot Hair also seems to have a bit of a mind of its own at times. Two notable examples in Shaman King: Ren's trademark spike of hair raises/gets taller when he gets angry. On the other hand, Ryu's pompadour (whatever state it's in) droops and raises with his mood. The most extreme example was when he realized that Lyserg had gone to another team, and his hair fell out of the pompadour instantly due to grief. Himeko of Pani Poni Dash has an expressive ahoge that not only wiggles when she's happy and stands straight up when she's startled, it also occasionally form shapes like a heart or a question mark, and in the first episode even became a rainbow when she cried buckets of tears. 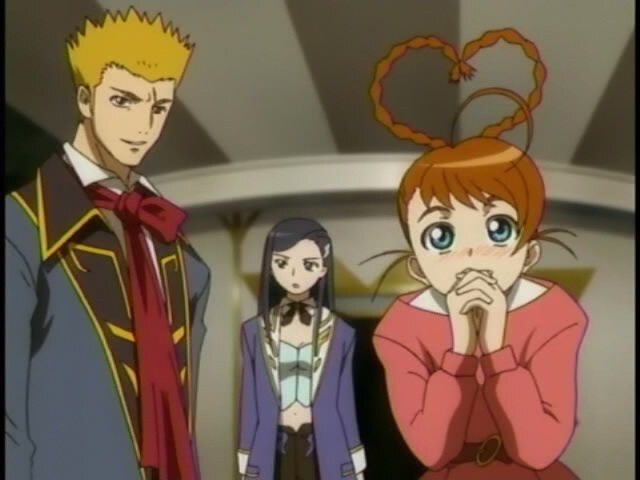 Tokyo Mew Mew: Retasu's braids do this on a few occasions, and Ichigo's pigtails also do this somewhat. In Chrono Crusade (manga version) when Satella is first introduced, one of her hair antenna curves into a question mark to show her confusion over something. In Axis Powers Hetalia, Yonsoo aka Korea's hair has a single strand that curls up. It's often drawn with a little face inside of the curl, so he literally has expressive hair. The Italies' hair curls also do a little of this, occasionally shaping into hearts when happy or going jaggedy in shock. There's also been a couple of instances where America's little ahoge will seem to emphasize his emotions as well. Austria's ahoge as well, in some instances. Most notably during the Buon San Valentino strip and the Maria Theresa and the War of Austrian Succession strip. Mahoro in Mahoromatic has two little sideways locks of hair that follow this trope. Solty in SoltyRei has her ears, which look like thick, green versions of Mahoro's side locks, do this. Noboru Yamaguchi's (for lack of a better word) pulsating afro whenever he's thinking hard in Cromartie High School. Also, just like the Saki example below, Hayashida's mohawk moves around regardless of context... Apart from the scene where he is confused, he scratches his head, and his hair scratches his hand. Ogiue from Genshiken has a spiky pigtail that sometimes stands up when she's startled. Suzuna from Eyeshield 21 has an antenna-like bit of hair in the front that zeros in on anyone talking about their romantic relationships (usually denying one). Also, sports commentator "Machine Gun" Sanada has sawblade-like protrusions of hair that start rotating when he gets fired up (moreso than usual, anyway). Kicker's hair in Transformers Energon goes white and ruffles whenever he predicts something. Touka's Idiot Hair in Saki. It spins! It stiffens! It points every which way! It's like it has a life of its own! Example regarding a hair piece: Tsukasa from Lucky Star's hair ribbon often straightens or goes limp and sagging, depending on her mood. Misao's braid in Rurouni Kenshin often acts like a cat's tail: from stiffening (or getting a kink ) when she's angry to curving up when she's surprised. Chou, he of perpetually vertical Anime Hair, once claimed that he was so mad his hair stood on end. Kenshin snarked right back that Chou's hair is always like a broom. Then there's Nono's hair, in DieBuster. It was part cute, part Moment of Awesome watching her conducting her newly-acquired drones using flicks of her hair. In Bakemonogatari, Koyomi Araragi's hair this way and also serves on occasion to point out that Something Else Also Rises. At times it also forms a question mark, and at one point in Nisemonogatari, it morphs into a kanji. Sayonara, Zetsubou-Sensei: Ai Kaga has a ponytail that wags like a nervous dog's tail whenever she apologizes. Which is all the friggin' time. Sernia Iori Flameheart of Ladies Versus Butlers!! presents us a particularly bizarre version of this trope: Her coiffure is already as ridiculous as it gets, with her curly pigtails which resemble two gigantic drills ◊. If Sernia gets upset, those drills actually start spinning (complete with appropriate sound effects)! On Sgt. Frog, Momoka's Fawcett curls become sharp and pointy when her Split Personality takes over. In the Railgun manga one page Mikoto's hair stands up waves around like an antenna points towards Touma, who is completely behind her at this point walking a different direction, and she runs after him. She has Touma seeking radar hair. Her mom suddenly develops an antenna when she senses an opportunity to make fun of Mikoto regarding "him". In Death Note, Light is noted for his ridiculously neat hair — except at the very end, when it flies around like crazy after he's finally exposed. In fact, any time he has a major freakout, his hair goes wild — such as right at the start, and after L introduces himself. Shugo Chara! has Hoshina Utau ◊ and her Expressive Pigtails. In Sweet Blue Flowers, Akira's braids jump up whenever she is startled. Which happens quite a bit. The titular character of Squid Girl has this in spades. Justified because she's a squid girl and the hair isn't hair, but ten very long, very fast, very powerful tentacles. Yotsuba&! : Yotsuba's quadruple pigtails point downwards when she's sad and become rigid when she's exhilarated or shocked. Although not used as extensively as many of the examples here, in IGPX Immortal Grand Prix major emotional shifts will cause Takeshi's hair curl to either point up for happiness or fall down for depression, complete with a corresponding slide whistle. 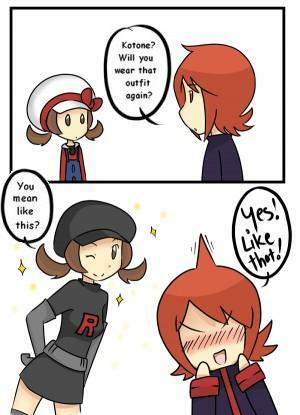 May from Pokémon did this a ◊ couple ◊ times ◊ during her first appearance in the anime. In the manga Wandering Son, this occurs often. All the characters have expressive hair and it changes depending on their reaction or the general scene. Sometimes its just messy because it is, while other times they're shocked or surprised so it stands up. Haiyore! Nyarko-san has Nyarko's overly long and expressive ahoge. Actually being an outer god, that is technically a tentacle, but that doesn't stop it from being VERY expressive. Lucy in Servant × Service has an Idiot Hair that has the interesting ability to change form depending on her current feelings. A pretty exaggerated example occurs in episode 11, when Saya saw Lucy in the bookstore but there was a bookshelf between the two, so all that is visible to Saya was the said idiot hair. Saya then started watching that idiot hair when Lucy looks for a book and predicted what happened accordingly—from looking for it(Side to side bobbing), to finding it(It literally wags), and at last to disappointment when it costs too much(It droops down). When she actually get to talk to Lucy, those predictions came to be completely correct. Haruka and Yuzu from Sakura Trick both have bits of their hair that react to their emotions. In No Matter How I Look at It, It's You Guys' Fault I'm Not Popular!, Yuu has an expressive hair ribbon during the school festival. In Love, Chunibyo & Other Delusions, Rikka's Idiot Hair bounces when she gets excited. In the Israeli comic Zbeng!, the female lead's hair colour changes based on her emotional state — black when in mourning, red when angry, etc. Franco-Belgian comics example: Titeuf . Axis Powers Hetalia fanfic Gankona, Unnachgiebig, Unità : When Italy is especially happy, his curl morphs into the shape of a heart. When he is distressed, it becomes all crumpled. Just like in canon. Girlfrenemies: According to Raven, the way Apple's hair bounces changes with her emotions. In Interview with the Vampire, Claudia's hair becomes curled and doll-like when she is turned into a vampire. Thereafter, whenever she tries to trim it, it grows back the same way. Moe Howard of the The Three Stooges. Whenever he gets scared, his sugar-bowl haircut would fly up in a hilarious manner thanks to a blast of compressed air from a hidden tube. As with the books, Tonks from the Harry Potter series can change her hair color at will. In the films, her hair color functions somewhat like a mood ring; it is pink when she is contented, and briefly turns fire-red when Mad-Eye Moody calls her by her first name, Nymphadora (which she despises). In A Tale of Two Cities, of all things. For most of the story, Jerry Cruncher's hair is simple described as very spiky, but in chapter thirty eight, while Jerry is being lied to, there is a "sudden extraordinary rising and stiffening of all the risen and stiff hair on Mr. Cruncher's head." As if to hammer the point home, Dickens relayed this to the reader by having another character notice the shadow of the hair moving on the wall. 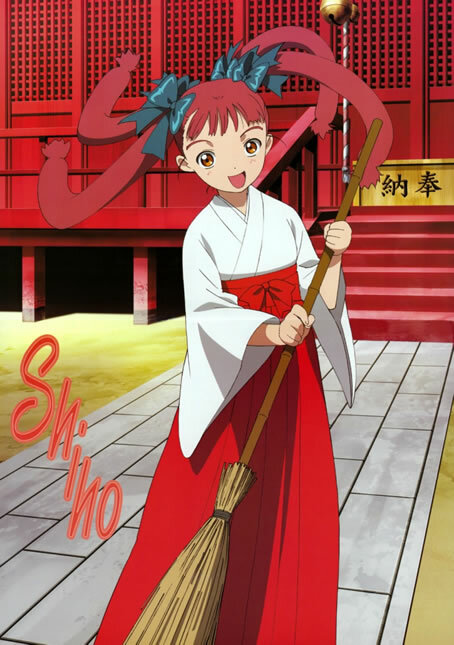 Sumi in Moetan (pictured above) has various symbols appear at the end of her ahoge, including exclamation marks and Cross-Popping Veins. Susan Sto Helit in the Discworld novels has hair that restyles itself to fit the situation. It's assumed this is one of the powers she inherited from her grandfather, although it's obviously not one he uses himself. In Warbreaker, one nation's royalty is able to change their hair color and length. Unless they are otherwise suppressing it, the color changes according to their emotions at the time. Tonks from the Harry Potter series is a Metamorphagus, which means she can change her hair (and other features) at will. Her standard hair color is pink, but it changes to several colors, such as purple and mousy brown throughout the series. This trait is also passed to her son Teddy. "Escape! ": Mike Donovan's perpetually Messy Hair "bristle[s] into separate wires" in his agitation. Lucky Starr and the Big Sun of Mercury: Bigman Jones's pale red hair "[stands] on end with passion". In "The Brain Stealers of Mars", Rod Blake's hair "[rises] very slightly from his head" when he finds out about the thushol's tendency to Kill and Replace the other Martians. Fully adult female Clan in The Clan Chronicles have hair with a mind of its own that twitches and curls roughly in tune with their emotions. In My Name Is Earl when it looks like Joy may be going to prison, Darnell becomes depressed and his hair starts to droop. Earl narrates that his hair acts like a mood ring. The Tenth Doctor from Doctor Who has this to an extent. General rule of thumb, the happier he is, the more gravity-defying his hair becomes (mostly due to the fact that he likes to run his hands through it when he's excited). In Dilbert, this is a qualification for becoming an engineer. In Zits, Jeremy has a great poker face but terrible 'poker hair'. In Peanuts, Linus' hair stands on end when he's startled, excited, angry, or just feels strong emotions. Daryan Crescend from Apollo Justice: Ace Attorney. He has a massive long hairdo reminiscent of a shark. It flops around, droops when you catch him lying on the witness stand and becomes rigid when he's in a good mood. Trials & Tribulations has Ron DeLite, whose cinnamon-bun curls of hair on the sides of his head uncurl and spring out when he's upset. This trope is actually pretty common across a lot of animations in the series, especially when the character is nervous. T&T also introduces us, in a flashback case, to Winston Payne's pompadour which droops whenever he's nervous. When Mia corners him into a state of shock, it rapidly disintegrates, explaining his present hair loss. Pearl's pretzel-hair mysteriously bounces when she's shocked, or grinning manically/happily. Also, when she's sad, her hair droops backward while she tilts forward. Hell, Phoenix and Apollo themselves. Their hair looks quite downcast when they're losing, and returns triumphant come victory time. Ace Attorney Investigations 2 introduces us to Sebastian Debeste's question mark-shaped Idiot Hair that turns into an exclamation mark whenever he's surprised. Uendo Toneido in Spirit of Justice has a ponytail that moves around depending on which of his Split Personalities is currently speaking. Laharl from Disgaea: Hour of Darkness has two hair "antennae" on his head that have the tendency to go stiff (or straight up) when he's particularly angry or annoyed. Trinity Universe: Lucius's Idiot Hair. It's a tension gauge according to him, but it still expresses emotions. Flonne has a field day asking him if it shoots lasers. Vocaloid: Some fan depictions of Miki make her ahoge change shape according to her emotions. Kino's ponytail droops in his sad sprite. And it is absolutely ADORABLE. Marle's ponytail turns into a fro when she's startled. Genki Girl Momoko from Aoi Shiro has short braids that stick up and go spiky when she is surprised or excited and droop when she's feeling down (not that that state of affairs ever lasts long). Toyosatomimi no Miko of Touhou is occasionally portrayed as having this in fanon with her hair...flappies. Her hair's supposed to look like cat/dog ears, since "satomimi" can also mean "animal ears". Kai's hair in Pokémon Conquest is very expressive. When she gets angry, it practically explodes. Marina from Splatoon 2 has expressive tentacles. This is most noticeable in her first hologram concert (the next concert downplayed their movement), but her "hair" frequently moves on its own. Mr. Milk from Making Fiends is almost completely bald, but has a few hairs on his head that stick up when he's scared or nervous. Charlotte seems to have an expressive bow. Snake in Metal Gear Awesome does this a lot with his eyebrows. They become thicker, bushier and/or longer the more pissed off he gets. At one point, they grow to the point they resemble tree branches, complete with oranges sprouting out of them. Multiple characters from Monsterful, Lawrence Spectrum flame hair is very expressive and often shows emoticons related to his emotions, including exciment or disappointment . Samantha Thing also uses her hair to enhance multiple expressions like doubt . Sapphire Gem hair shows this in a lesser degree. Susan of El Goonish Shive: Dan says "Badass Hair in the Wind Effect With No Wind is your friend." Not to mention Grace. Justified in that she actually has antennae from her uryuom blood. This is part of Ashley's arsenal of cuteness. In one embarrasing moment it goes from normal to deflated , then stands on end . The sorceress Suspiria in Flipside has her hair enchanted to reflect her emotions. It also becomes large and billowy when she does magic. Freefall's Sam and Helix have expressive radio antennae. In The KA Mics Gertrude's pigtails & Nikki's ponytail sometimes do this. Lovely Lovecraft: Noyes appears to have this, as the spiky portions of his hair are once shown drooping in a moment of distress. Yuki from Megatokyo, thanks to magic. Misfile's Missi has had her pigtails stick out a couple times. The author of Other People's Business has joked that Mercedes' hair is sentient, and attempts to restrain it will only incur its wrath. Kavonn of Charby the Vampirate has hair and eyebrows that shift and twist with his moods due to his prehensile hair. In Sequential Art, Pip's strand/feather perks or droops depending on his mood. Many fans consider this to be one of the most endearing things about Shadowgirls' resident Badass Normal Lindsey Jun Yeoh. The girls of Wapsi Square have hair that behaves according to their moods. If happy, their hair is perky. It droops if they're sad, and it gets spiky and pointy if they're angry. (Fallapart)Fernando the zombie from Unlife Is Unfair has some rather expressive antenna hair . Blip: On this page , Angela wonders how K's hair does that; which is funny since Angela's hair can be just as expressive . Used, and then lampshaded, in Questionable Content here. In Rhapsodies Paul's mullet fluffs up whenever he's excited or angry. Rachel's hair tends to flip upwards whenever she's shocked or frightened in Ladies In Waiting. In The Inexplicable Adventures of Bob! Molly, Golly, and Jolly are Cute Monster Girls with big pompom-like poofs of pink hair on either side of their heads, which (along with their tails) move about in accordance with their emotions, making them look very expressive. While never seen in action, the author of the web fiction serial Dimension Heroes has stated that the tufts of hair on Tami's head change depending on her emotions; when she's sad, they droop. When she's scared, they stick straight up. When she's furiously angry, they frizz out like a cat. In Gaia Online's Valentine's Day '09 NPC Valentines, Blaze's gigantic ponytail is formed heart shapes. A rare, real-life example: John of the VlogBrothers has a nervous habit of running his hands through his hair when anxious, which causes it to get puffy. Slipknot, a member of the superheroic Euroguard from the Global Guardians PBEM Universe, has long, superhumanly strong hair he can use as a set of hands. Naturally, it also reflects his emotional state. The animated version of How the Grinch Stole Christmas!. Harley Quinn from Batman: The Animated Series has blond pigtails when she's not in costume that perk up or droop, depending on her moods. They still do it in costume; they're just stuffed in her hat and take it with them. Sari Sumdac in Transformers Animated has the "sticking up pigtails" version, though it a couple occasions they friz up like a scared cat's tail. Somewhat justified. She is a robot and the hair may just as well be metallic. 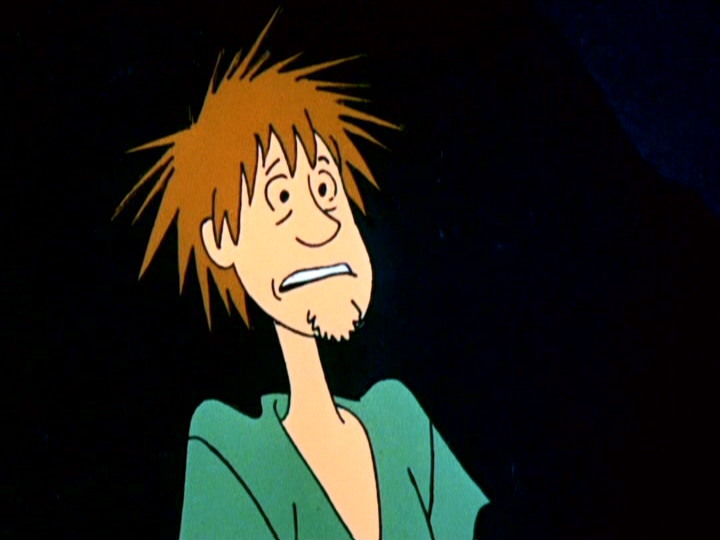 Each hair on Shaggy's head has a tendency to stick out every which way when he's frightened ◊. Parodied on The Simpsons. When Willie Nelson successfully reunites the family, his trademark braids rise like those of Pippi Longstocking. Krusty the Clown on The Simpsons has expressive hair, especially in the season 4 episode "Lisa's First Word". During a Krusty Burger commercial for the 1984 Olympics, Krusty bites into a Krusty Burger. When the commercial ends and the director yells, "Cut! ", Krusty spits out the burger and his hair droops (then slightly comes back up after he drinks some booze from a flask to wash the taste out of his mouth). In "The Caper Chase", Lisa's hair "spikes" droop when Homer becomes a college professor and shows that he doesn't have the slightest idea of what he's supposed to do. In some early episodes of KaBlam!, June's ponytail seemed to stick up when she was scared or shocked, and drooped when she was sad or tired. This was dropped after a few episodes, however. Loopy's pigtails seem to rise a bit when she's scared, curious or inspired. Also in the episode "Comics of Champions", when June keeps on teasing Henry about his crush on Thundergirl, he gets so upset that his hair goes on fire, but June puts it out (wearing a firefighter hat with a siren in the background). The Tick's antennae react in a similar fashion. Pinkie Pie's mane is apparently made curly by sheer exuberance; when she's bummed out (as seen in episodes such as "Cutie Mark Chronicles", "Party of One", and "Magical Mystery Cure"), it becomes straight. As seen in "The Best Night Ever", it can't even be styled when she's happy or excited—it just springs back to its usual curly shape. Whenever a character imitates another, quite often their mane will briefly shift into the style of the character they are pretending to be. In at least two episodes of Hanna-Barbera's version of The Little Rascals, when Darla is frightened, her hair resembles a brown sea urchin. In the ChalkZone episode "Secret Passages", Rudy's cowlick stands up on it's own when he gets scared at the beginning of the episode. Though it also counts as Early Installment Weirdness as this never happens again in the show. On both the original show and reboot of The Powerpuff Girls, Bubbles's pigtails droop when she's nervous, sad, or unsure about something. When she's surprised, shocked, or excited, they tend to either perk up or flick upwards. In Barbie Star Light Adventure, Barbie has a pink streak in hers that seems to fluctuate in intensity depending on how sure of herself she feels, even disappearing entirely when the opposite is true. Cruella De Villes niece Ivy from 101 Dalmatians: The Series has two pigtails that stick upward and curve like devil horns whenever her bad side shows. This is actually Truth in Television, as humans still retain tiny muscles in the hair follicles that are used to puff the hair in most warmblooded animals, and this is the same reaction that give us goosebumps. Said muscles are much too weak to control long and heavy hair, but if a person has, say, a crewcut, it can visibly swell when that person is angry, afraid or simply cold. This is also why cats ripple and dogs raise their hackles when they're alarmed. Part of this is a vestigial defense mechanism from when humans were much hairier animals. By making all the hair follicles on our body stand on end when we're afraid, we look larger to predators and have a chance of scaring them off. Some birds (like cockatoos and bluejays) have expressive feathers on their heads (crests). Most birds, in fact, will fluff up for various reasons (happy, frightened, cold, etc. ), sometimes resulting in what looks like little more than a feathery fluffball with legs. Consequently, paleontologists think that some dinosaurs may have done this, too.